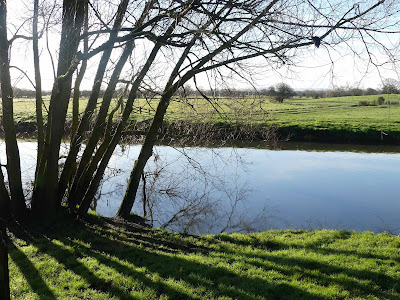 Oh the joys of early Spring sunshine and clear blue skies on stunning early morning standing by Langport's River Parrett. 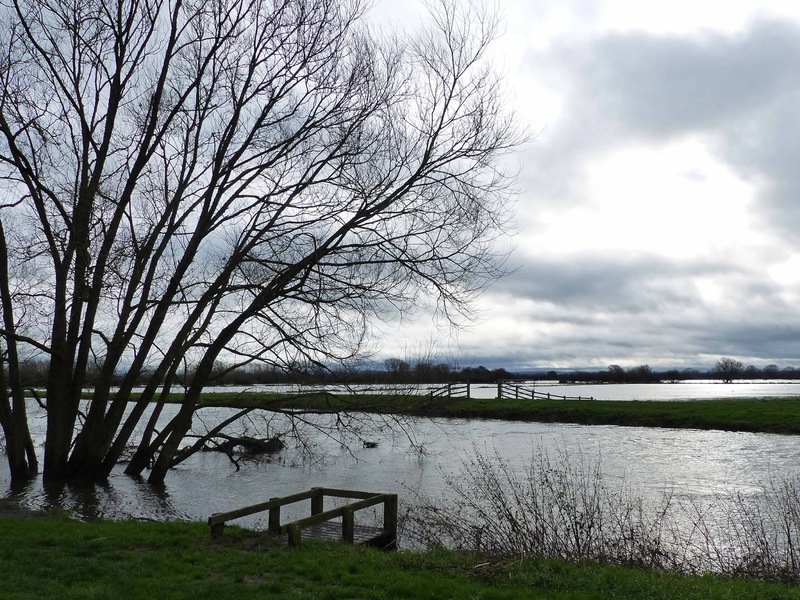 How wonderful it is to forget all about winter cold and grey sky days for a good while - we hope! 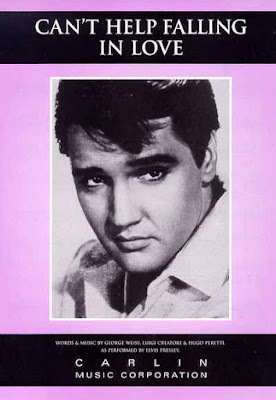 Our first song set for 2019 has started with lots of gentle and heart-lifting singing, including this mellow song first recorded by Elvis in 1961 and published by Gladys Music. Written by Hugo Peretti, Luigi Creatore and George David Weiss, it was based on a popular French love song 'Plaisir d'amour' written in 1784 by Jean-Paul-Egide. Our set has also included a few more lively arrangements and it has been lots of fun learning African Zulu song 'Shona Malanga'. A working song of the anti-apartheid era that translates to 'Shorten The Day', it is now a song of celebration. 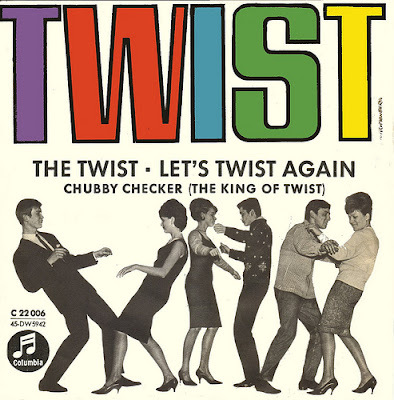 We are confident that we can master the song AND the dance steps very soon! Our first performance of 2019 was on a glorious sunny Spring day at the South West Choirs Convention in St Georges Hall in Bristol. 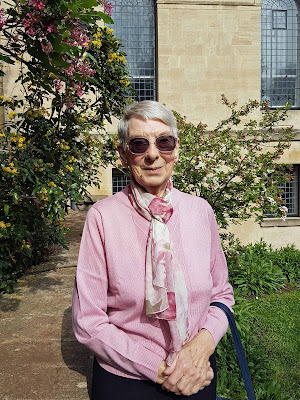 The hall has recently been refurbished and the several hundred people who traveled far and wide to attend were able to enjoy the new glass atrium and pretty surrounding gardens. 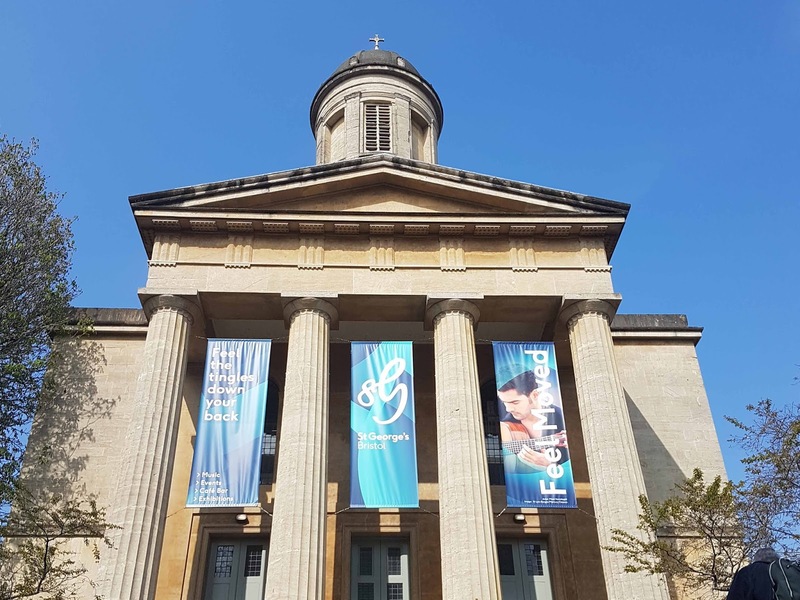 This annual convention has taken place in the heart of Bristol each Spring for the past 15 years and long may it continue. 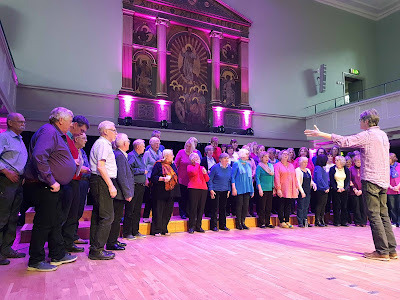 Bright tops and dark bottoms were the in colours for many of the choirs attending and so our colourful attire was very in vogue. 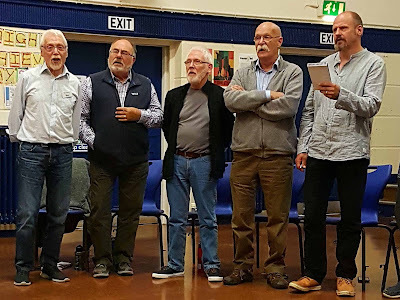 It was lots of fun performing 'Can't Help Falling In Love' and Serbian Folklore song 'Mala Moja', led as always by our talented Musical Director Pete Linnett. We were also able to help one of our longest standing members, Gill Simms, celebrate her 80th birthday weekend - a fabulous achievement that we were delighted to share. 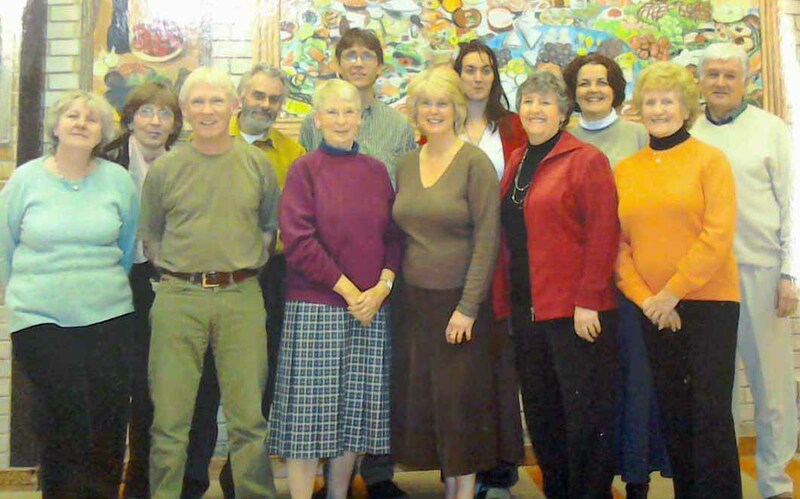 Gill is one of the choir's founding members and you may spot a few other familiar faces too - least of all Pete's! How wonderful it is to celebrate life events with song amongst people who share this life enhancing passion. Our thoughts this Easter are very much with absent friends and we look forward to singing time together soon. 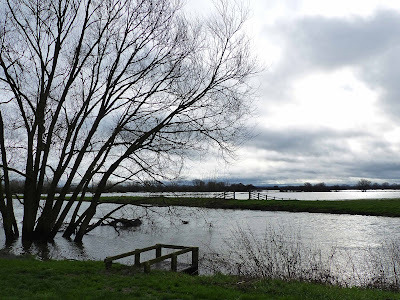 Accessible roads have been particularly appreciated in December and thankfully allowed choir members to travel to our two Christmas performances. 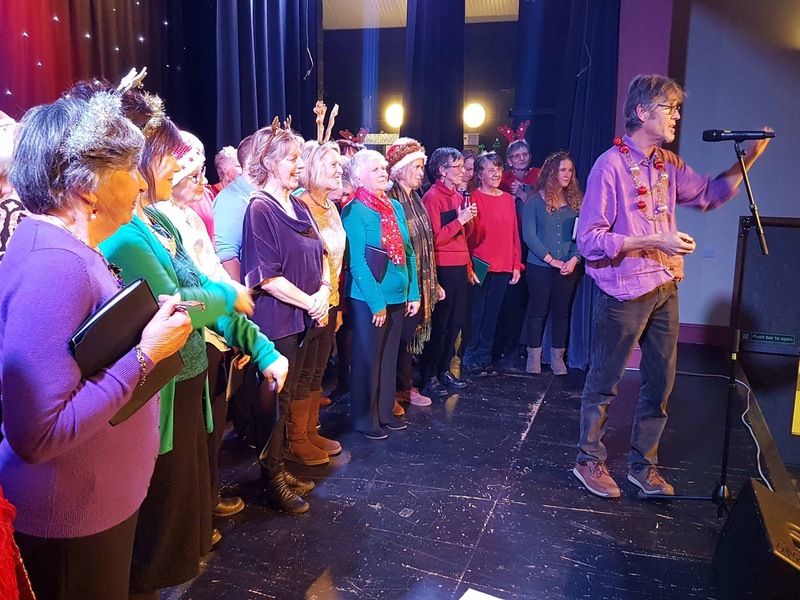 First up was 'Sing Out for Christmas' at the Guild Hall in Chard on 15th December, were we were delighted to support Pete Linnett's Meeting Voices Community Choir to help raise funds for Dorset & Somerset Air Ambulance. And finally for 2018, we gave our end of term performance at Immacolata Care Home in Langport where we received a very warm welcome from staff and residents. Our Christmas set this year included traditional festive renditions of Silent Night, Winter Wonderland and Shepherds Arise and also a few less seasonal tracks - we greatly enjoyed singing 'Chains' written by Gerry Goffin & Carole King and first recorded by the Beatles in 1962! And so another year of scintillating song with our Musical Director Pete comes to an end - we really appreciate the singing opportunities that Pete provides for us. 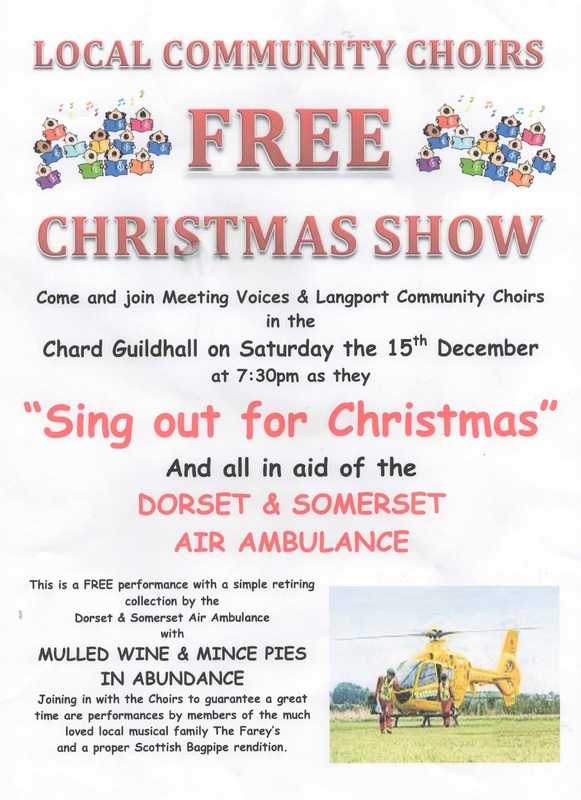 After weeks of practice, song parts can stay with singers for many days following and you may well hear an impromptu rendition from one of us when walking the sparkly streets of Langport this Christmas! As mild as it still is in Somerset, the darker evenings leave no doubt that we are well into autumn. How easy it is to go into hibernation, particularly when faced with the thought of a dark journey to practice sessions - Pete our musical director has the longest journey of all from Lyme Regis. 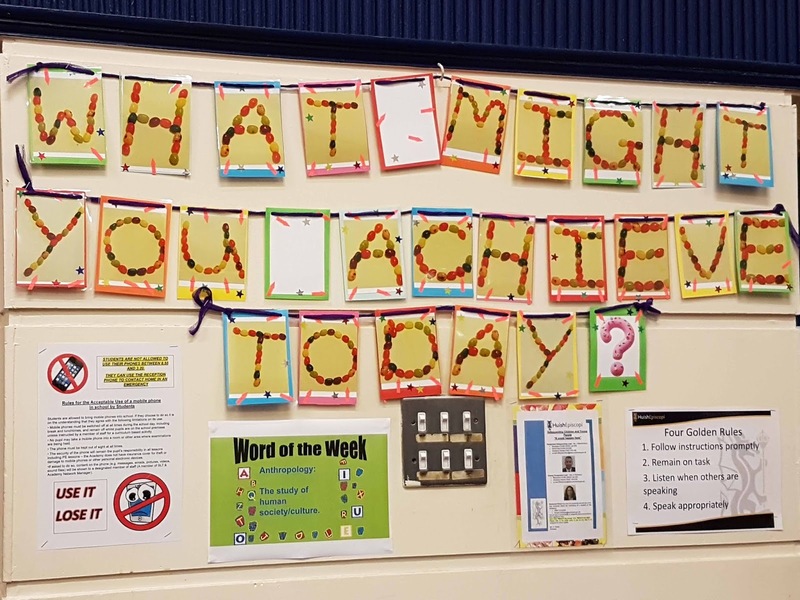 The noticeboard in the hall at Huish Episcopi Academy reminds us why the effort is well worth while. 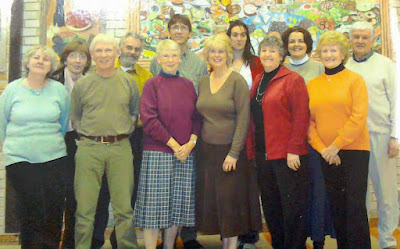 Getting together with friends we have missed throughout the summer months is such a great pleasure too. We particularly enjoyed seeing Bernie back this term to make up our base numbers. 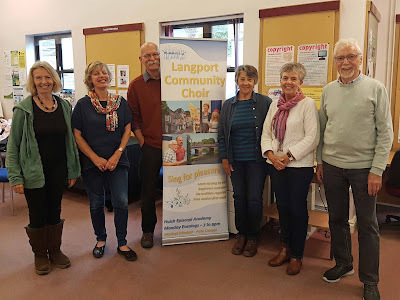 Keen as ever to promote the benefits of singing, we were delighted to set up a stand for the morning recently in Langport Library. 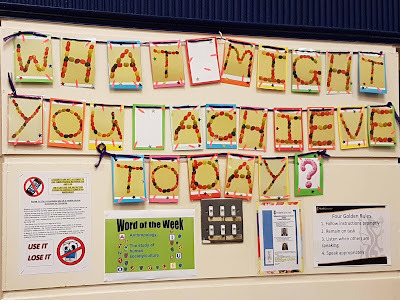 We are a very happy bunch and it is likely that we generated a bit more merriment than a library is used to! 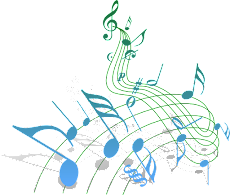 And so our Monday evenings are now happily being spent learning new songs for our autumn and winter performances. 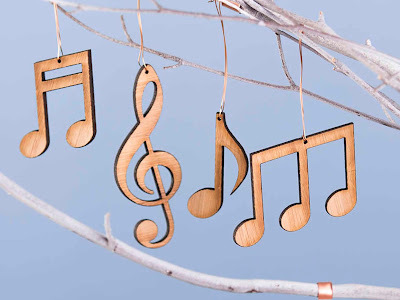 We have made great inroads on learning three new pieces this term, plus we have started on our first Christmas carol! 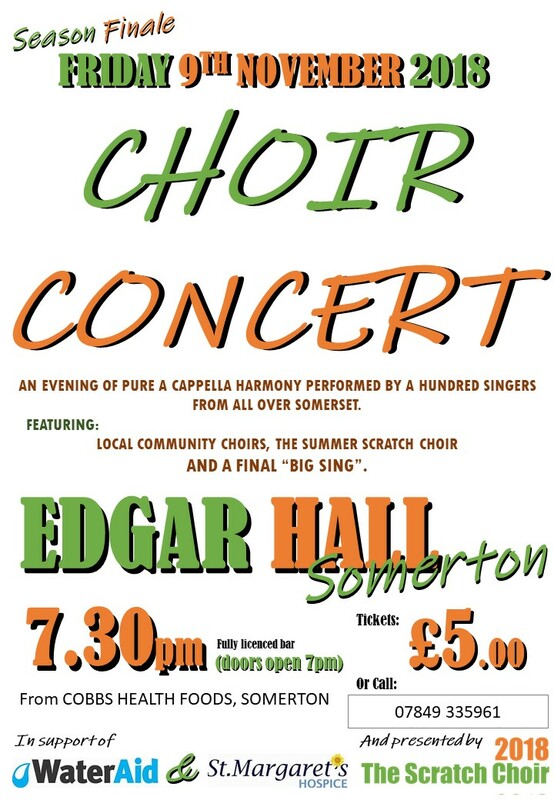 Our next performance is with other passionate Somerset choirs at the Edgar Hall in Somerton on Friday 9th November 2018. 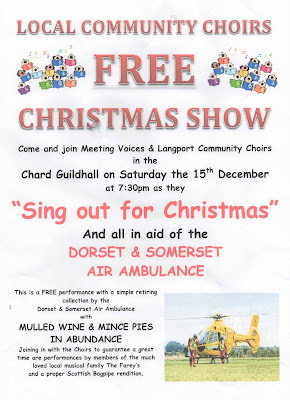 And for the diary our first Christmas performance will be with the Meeting Voices Choir at the Chard Guildhall on Saturday 15th December 2018. Please do come along to see us and support the great causes for both of these events. 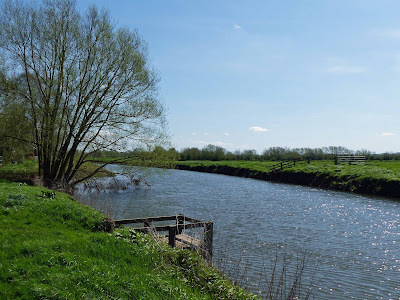 With record temperatures for many a year, summer days are passing at speed and the Langport Community Choir summer diary dates are now all done and dusted. First up was a late request to take part in the BBC Radio Somerset programme 'Clueless'. 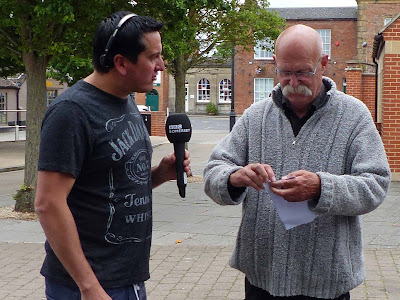 On one of June's chillier Sunday mornings, presenter Andy Bennett soon warmed up the hardy dozen that he 'found' in the main car park in Langport. Andy claimed just before starting off the singing, that singing is something he would never be able to do - the offer of joining us is still open Andy! 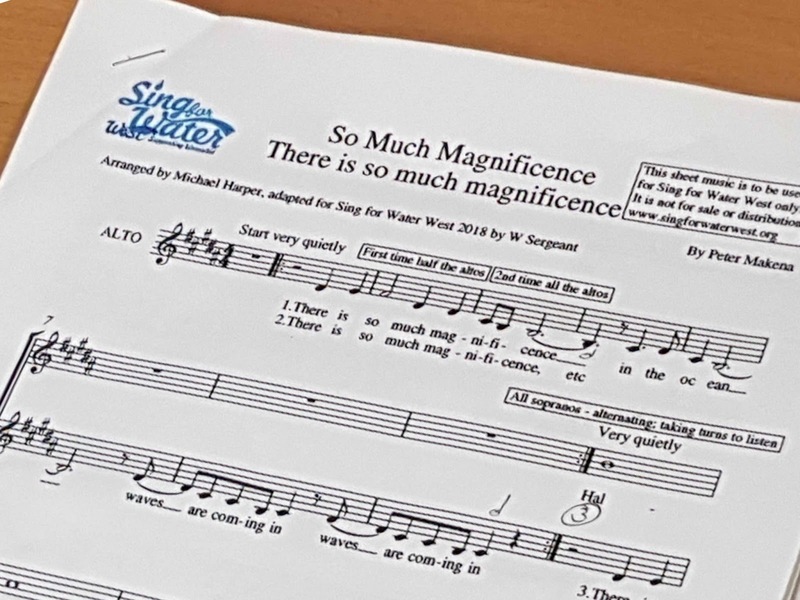 It was also a great opportunity to promote our Performance and Social Evening on 9th July 2018 where we sang the Sing for Water West 2018 song set that we have worked on since the beginning of the year. 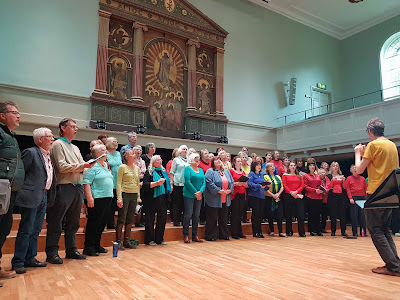 It turned out to be one of the hottest evenings we had ever performed on and we are would like to give our thanks to all who came to support us. 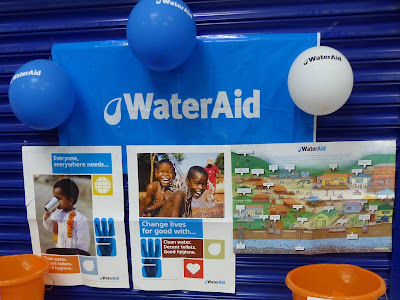 We were delighted to raise in access of £280 for the Sing For Water UK Charity WaterAid, in support of the millions who still live in communities around the world where there is no access to clean water resources near to home. It seemed rather poignant that the following The South West Water event at the Brunel Passenger Shed on 15th July 2018, was similarly an incredibly hot day. 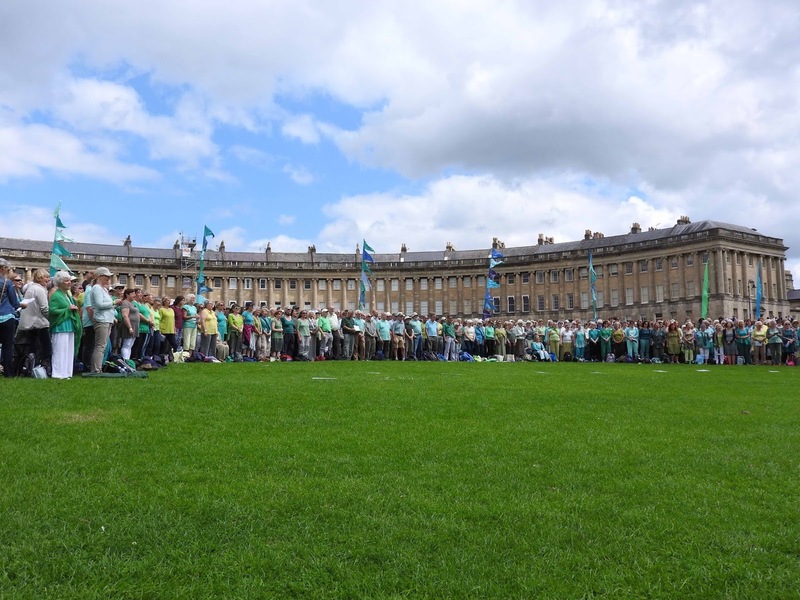 Everyone involved in this event did an amazing job and in excess of £31,000 was raised by the end of the weekend. 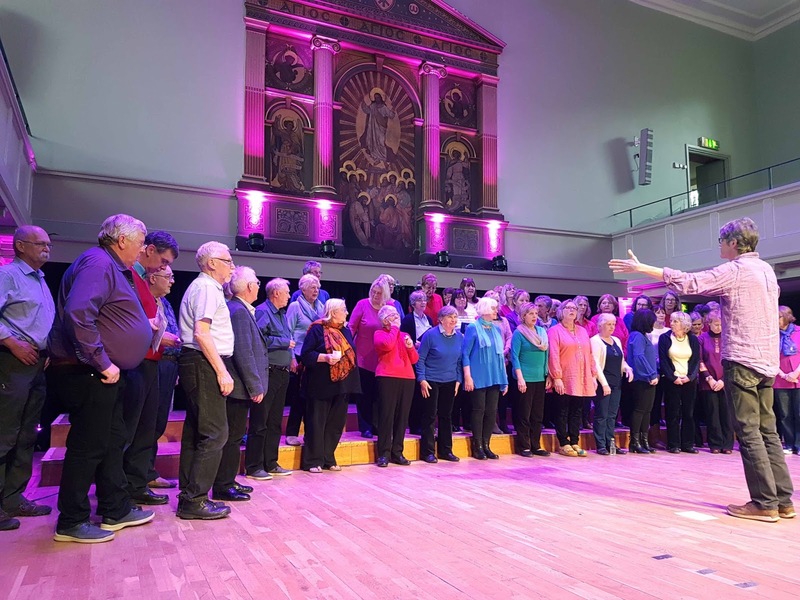 How fabulous it is that through singing we can improve our health, learn new skills, increase confidence, make great friends and help those who are very much less privileged than we are. 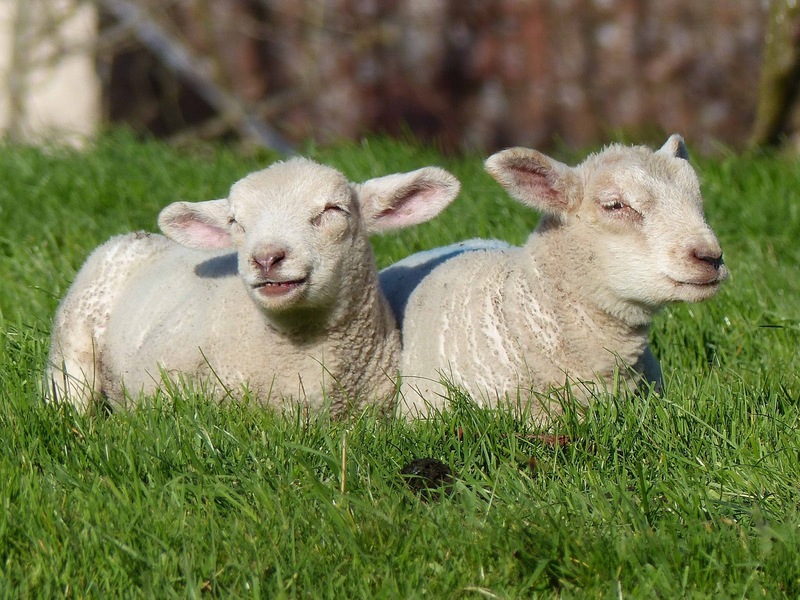 Good wishes to all for a continued summer of sunshine. Keep singing until we meet again in the Main Hall at Huish Episcopi Academy in Langport on Monday 10th September 2018. 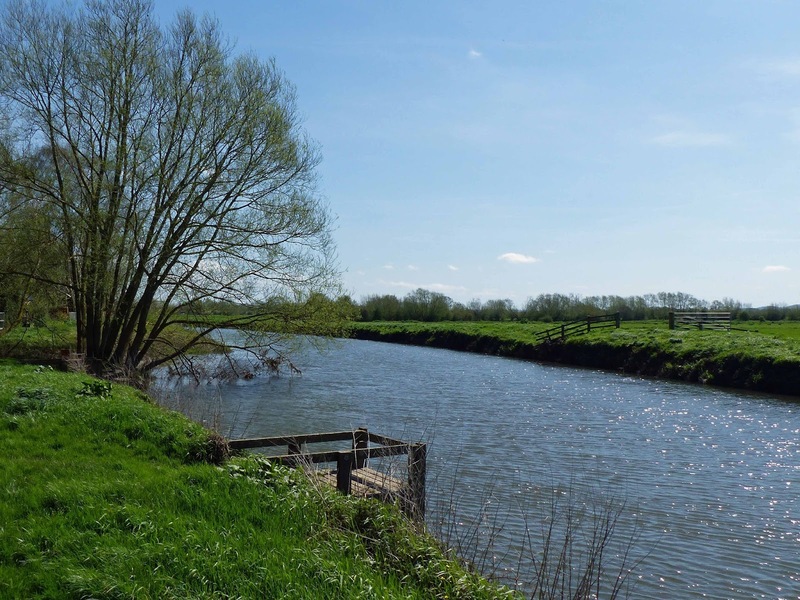 With 1st June being the start of the meteorological summer, it's a great time to start firming up plans for the delightful long days of daylight ahead. The end of the summer term will undoubtedly come round quickly, as will the Sing for Water West Event on Sunday 15th July 2018 at the Brunel Passenger Shed in Bristol. This massively popular event raises funds to provide safe water, taps and toilets for some of the world's poorest communities and to date has raised over £1 million! 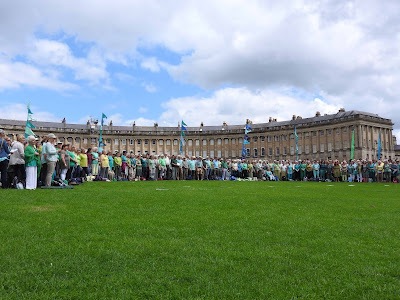 Members of Langport Community Choir last attended this event in 2016, when we joined forces with close to 1000 singers on the Royal Crescent in Bath. 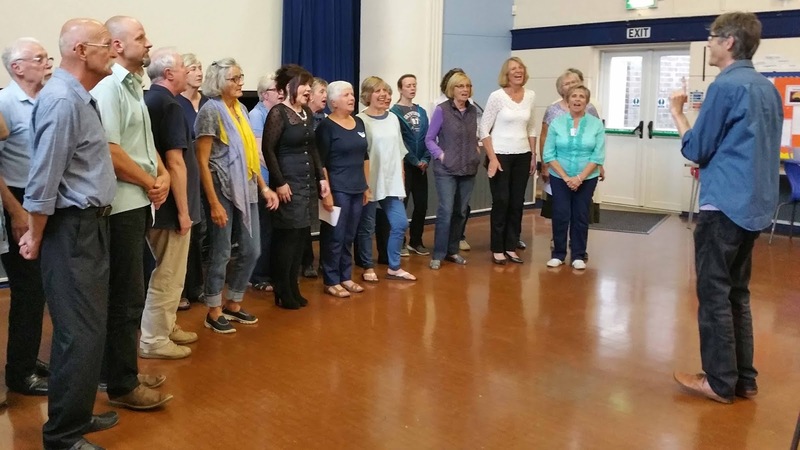 This year Langport Community Choir will be helping to raise Sing for Water funds by giving an End of Term Performance at Huish Episcopi Academy on Monday 9th July at 7.30pm. 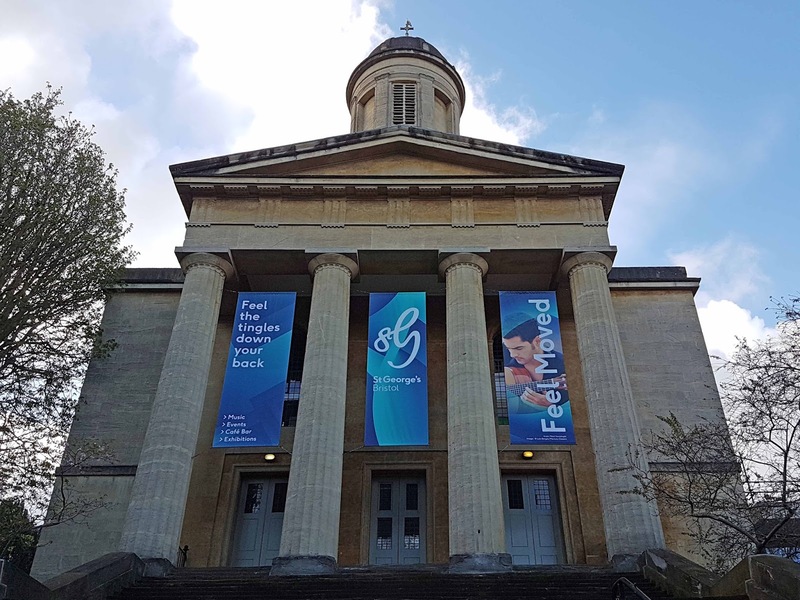 Guests are most welcome to come and join our evening of song and refreshments, where we will be happy to receive donations towards this extremely worthy cause. 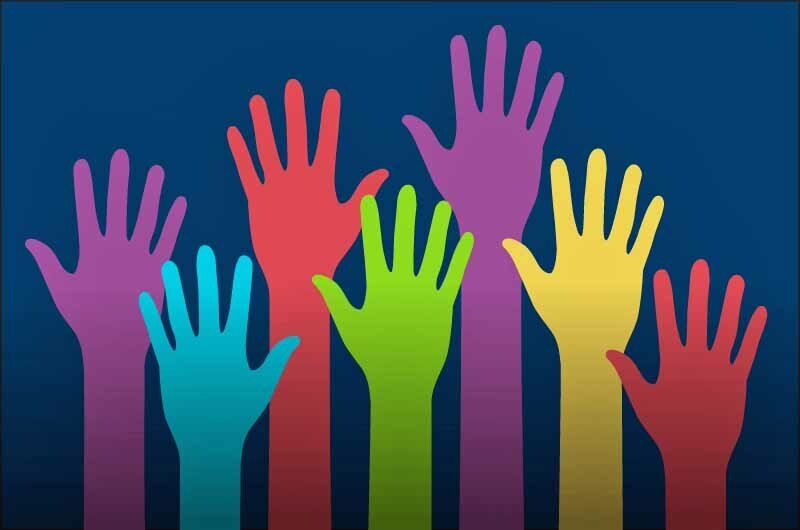 And last, but by no means least, the date has been set for our Annual General Meeting on Monday 16th July 2018 at Huish Episcopi Academy at 7pm. Agenda items are now requested from members - please send to our secretary on langportcommunitychoir@hotmail.co.uk by Monday 25th June. 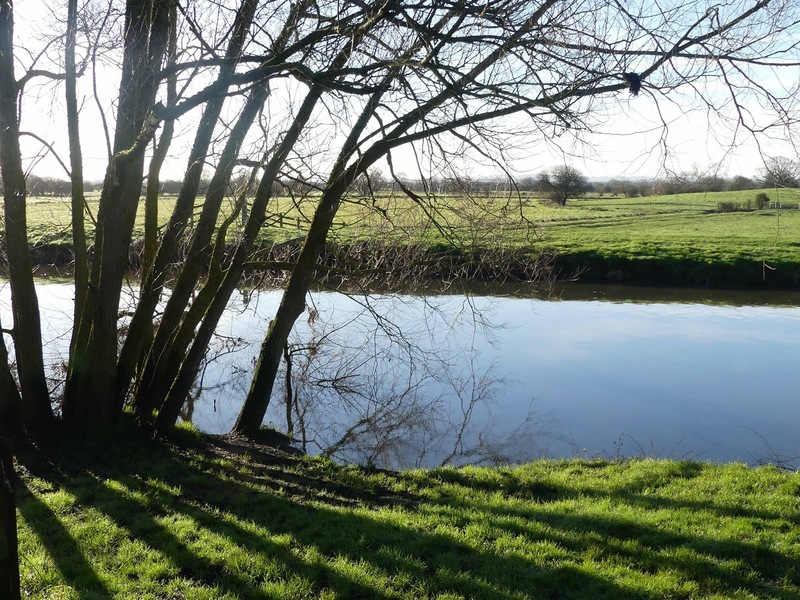 At last spring has arrived and the sparking sunshine on the river Parrett in Langport this week makes the heart sing - even for those of us who love to sing all the time! 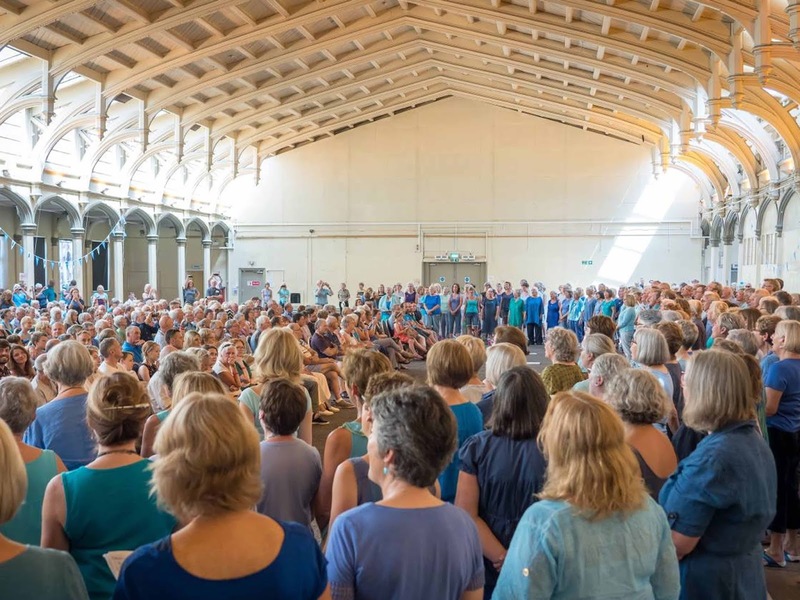 In fact water is a big theme for Langport Community Choir this spring as we will be attending Sing for Water in July in the fabulous Brunel Passenger Shed in Bristol. 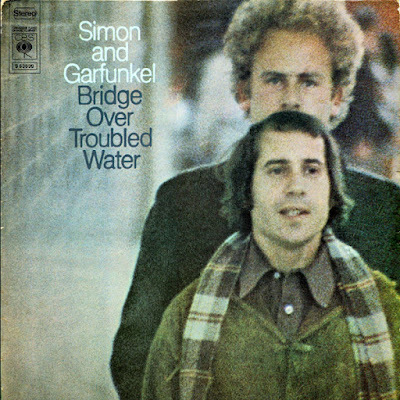 Learning always starts well ahead and first up has been an arrangement of the cult 1970's song by Simon and Garfunkel - Bridge Over Troubled Water - a perfect fit for winter practise sessions often entailing water logged roads! We have also started work on another 1970s musical arrangement written by Peter McKenna and arranged for Sing for Water by Wendy Sergeant. 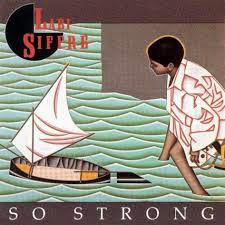 A celebration of the ocean, the words for this song are believed to be hundreds of years old. 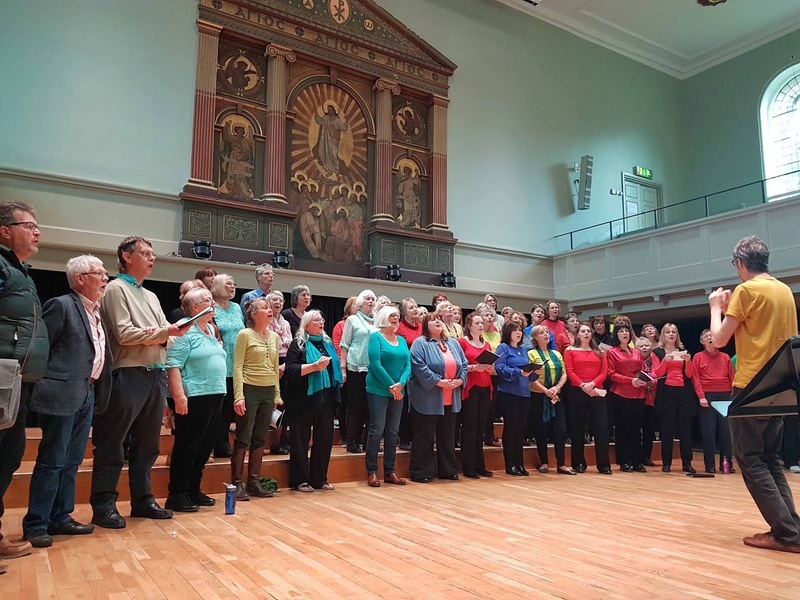 Many our members also had the pleasure of a fun and full on day of song at St Georges Hall in Bristol at annual Community Choir Convention. 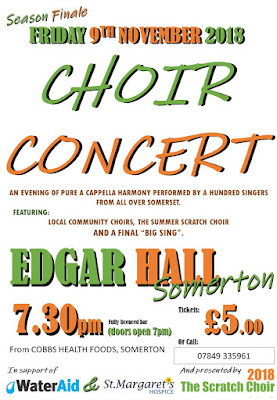 In its 18th year, this very popular event is attended by choirs from all over the South West. 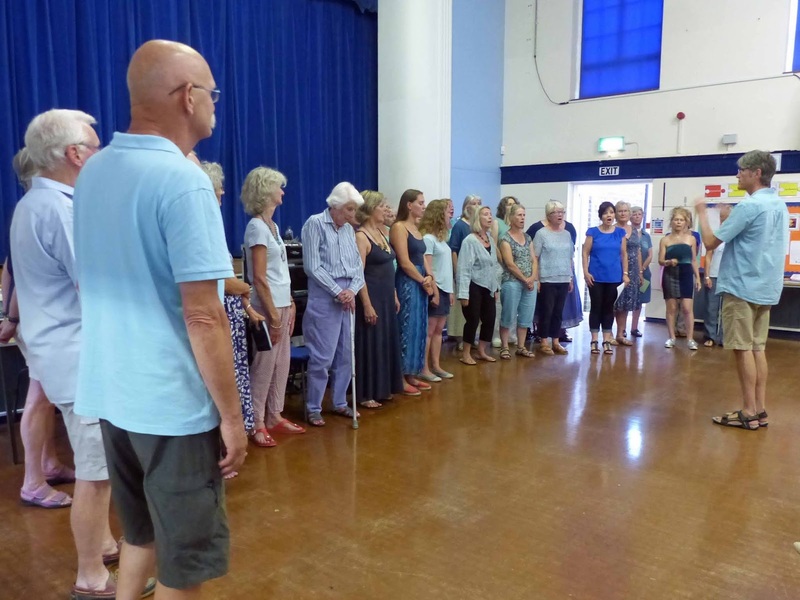 We gave a joint performance with the Meeting Voices Choir from Chard also led by our musical director Pete Linnett . Here we are attired in our 'brights' theme warming up for our renditions of 'So Strong' and 'Someday'. 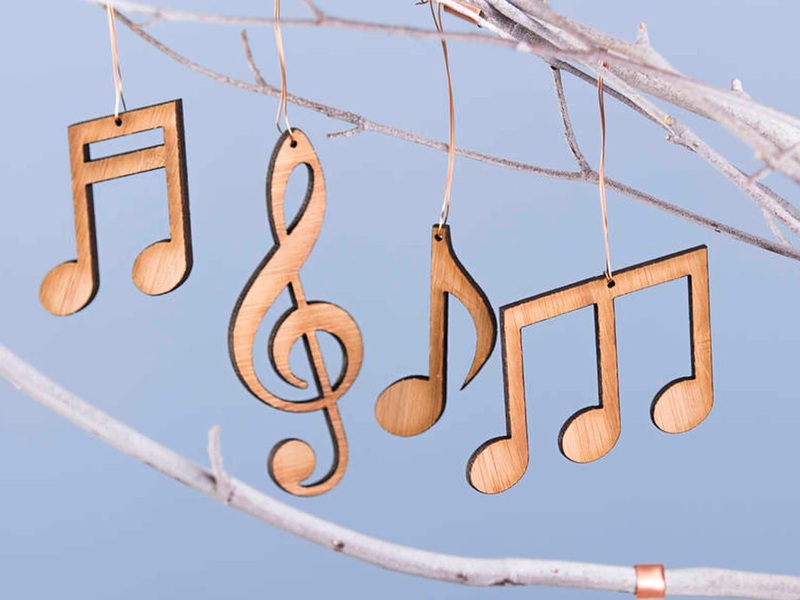 A big thank you as ever to Pete for his musical direction and keeping us supplied with marvellous musical experiences - here's to lots of more heart warming moments this spring. Pete's arrangement of 'Let's Twist Again' was also perfect for getting the circulation going - it's impossible to sing without some sort of hip movement! It's also been fun this winter to learn new arrangements of carols that many of us have known for a lifetime. 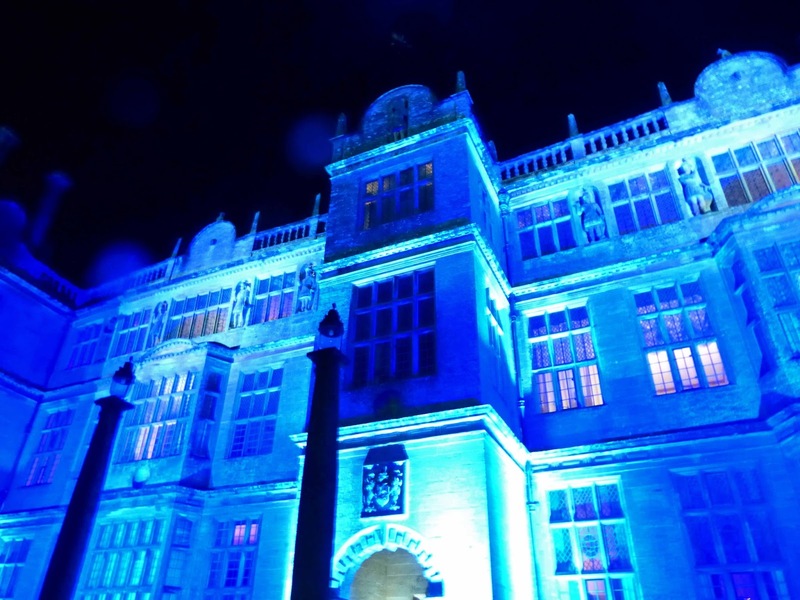 This year Pete offered up a new take on the firm favourite 'Silent Night', which was perfect for our first festive performance at a Montacute House's Lantern of Light evening. 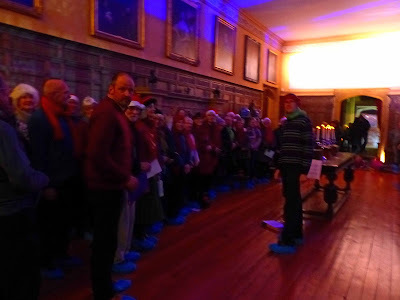 A particularly wet and cold winters evening, we felt very privileged to sing in the Great Hall at Montecute. With undertones of Christmases past, the magnificant surroundings and a receptive audience made for a very enjoyable experience - and we didn't mind a jot about fetching blue protective shoes and squinting in the ambient light at our carol sheets!